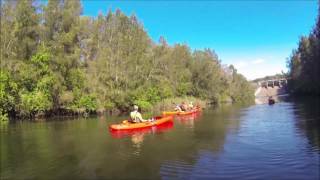 Connect with the beauty of the southern Moreton Bay waterways with Redlands Kayak Tours. Take your family members, friends or workmates, or go solo, and let the operators guide you on a kayak tour you will remember forever. 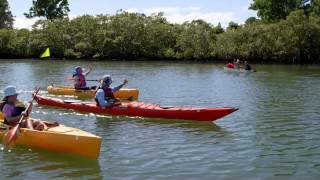 Your paddle journey of discovery can take you exploring along creeks, through mangroves, off the closest sand beaches to Brisbane and out into more open waters. Along the way, enjoy your guide’s knowledgeable commentary and the abundance of bird and marine life. At the completion of your tour, relax with fellow paddlers over light refreshments. A range of tour lengths – from 90 minutes to three and five hours, plus multi-day sea kayak adventures – ensures a tour suitable for all ages from eight years, and all levels of paddling fitness. 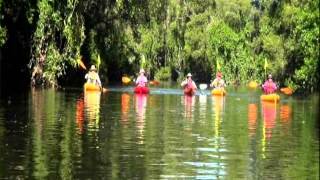 For a natural, serene, scenic and eco-friendly adventure that comes with highly experienced guides and a good dose of excitement, contact Redlands Kayak Tours. They may be located only 30 minutes from Brisbane but they will have you feeling light years away from the city grind in no time. For tour times, locations, and some amazing photographs, visit the Redlands Kayak Tours website. 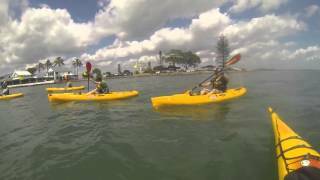 Half Day Kayak Tours operate for three hours and cater for all fitness levels! All tours include basic paddling tuition, photos emailed and light refreshments! For family or group booking prices please contact their office! Short Kayak Tour operates for one and a half hours and caters for the beginners and families wanting to explore the outdoors! All tours include basic paddling tuition, photos emailed and light refreshments! For family or group booking prices please contact their office! Their Full Day Tour operates only a few times each year. This tour leaves from the base of Tingalpa creek and explores the entirety to the upper reaches of the Creek to the viewing the the Leslie Harrison Dam Wall. This tour covers 25 kilometres of kayaking and is for the experienced and fit kayakers only. Tour includes, snack for the journey, Morning Tea break to stretch legs at half way and lunch on return of the trip. Witness the spectacular sunrise over Moreton Bay when you join them for this early morning four hour tour across the bay. For experienced kayakers only, the tour culminates with breakfast at one of Queensland’s most iconic pubs, The Grandview. This tour departs from Wellington Point and arrives at GJ Walter Park at Cleveland. 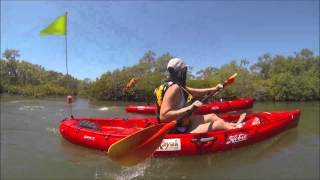 Join them on a romantic, peaceful kayak tour by the moon light on Moreton Bay. This tour begins at GJ Walter Park kayaking along the foreshore to Cleveland Point and Lighthouse. They will take in the lights overlooking Manly, Wellington Point and Raby Bay. Your kayak experience takes approximately one and a half hours. 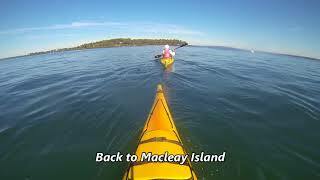 They’ve got one of the top 10 sea kayaking locations in Australia on their doorstep and they know you will love their eco-tourism expeditions that will challenge yourself through sea kayaking. They’ve got over 1000 dugongs in the Bay, dolphins and turtles, as well as beautiful mangrove eco-systems and unique Aboriginal stories around the islands. Their overnight and multi-day expeditions will leave from the Redlands Coast mainland and navigate around parts of well-known islands: Peel, Stradbroke, Coochiemudlo, Moreton and more. Their expeditions will cater for those that enjoy the great outdoors, staying in spacious tents. All meals and snacks will be provided as well as a glass of wine at sunset. 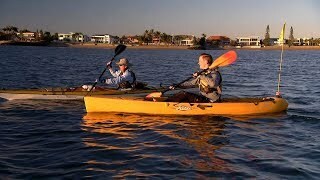 They will be using highly experienced and qualified sea kayak guides and will provide all equipment. Kayakers will simply need to bring their own clothing and sleeping bag. They will also have a host whom will travel on each of the expeditions, ensuring all kayakers are looked after, being there to provide local knowledge, history and coordination.